Translations of the ancient Book of Mormon language taken from the transcribed characters of the reformed Egyptian, including linguistic and scientific research of its Mesoamerican setting. 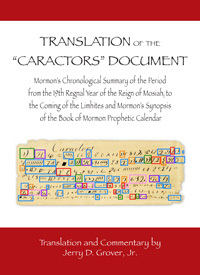 Mormon's Chronological Summary of the Period from the 19th Regnal Year of the Reign of Mosiah I to the Coming of the Limhites and Mormon's Synopsis of the Book of Mormon Prophetic Calendar. A small scrap of paper entitled "Caractors" (also known as the Anthon Transcript) that contained Reformed Egyptian characters copied from the plates from which the Book of Mormon was translated has remained an enigma for more than a hundred years. Finally, the characters have been successfully translated. 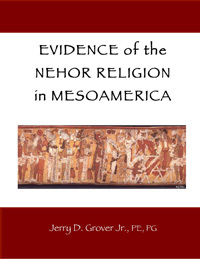 In a book that is the first of its kind, Jerry Grover, a professional civil engineer, geologist, and translator, has been able to crack the code of the "reformed Egyptian." The author's approach is meticulous and scientific. This book is a landmark event in Book of Mormon studies and is a book that must be read by every serious student of the Book of Mormon and of Mesoamerican studies. The author is dedicating all proceeds from the book to additional scientific studies to cast further light on the ancient setting of the Book of Mormon. 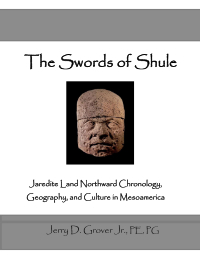 The Olmec civilization has long been considered to be the Jaredite civilization. New evidence is presented here that provides a reliable correlation of chronology between Mesoamerican archaeology and the Jaredite timeline. New etymological and scientific evidence now provides a method of establishing a more detailed geography of the "land northward" referred to throughout the Book of Mormon, the Old World point of departure of the Jaredites, and Olmec cultural elements reflected in the Book of Mormon text. The prophecies of Abinadi in the Book of Mormon, his sacrificial death, and the deaths of his murderers all correlate with Maya rituals and ceremonies. The later order of Nehor, having common elements with the king Noah syncretic religion, also correlates with known Mesoamerican religious practices, one correlation being the Principal Bird Deity and its manifestations. Two other religious traditions, the "Great Spirit" and Amalekites, are derivatives of the Nephite religion. This book makes and demonstrates that Jaredite names and terminology and later Jaredite-derived names originate from ancient Sumerian. All unknown words in the Book of Mormon are evaluated and analyzed as to their original meanings. Also important is the demonstration that the Book of Mormon translation utilizes target source languages, and all transliterations are standardized to these languages. 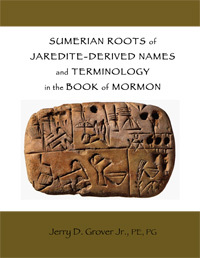 This book shows the meaning in Sumerian compound words of all of the unknown words and glossed words in the Book of Mormon, as well as looking at all other Book of Mormon names. Also featured is an analysis of interpreted names and their significance on determining the language of the plate stack. Ever since the publication of the Book of Mormon, attempts have been made to place it in its geographical setting. Various geographical models are being debated. In a book that is the first of its kind, Jerry Grover, a professional civil engineer and geologist, utilizes geologic and geophysical analysis with clues in the Book of Mormon itself to provide an eye-opening placement of the Book of Mormon in its geologic setting. 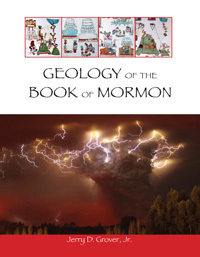 The book includes extensive details and a professional academic technical analysis of volcanoes, fault systems, meteorology, and unlike many approaches that cherry pick conveniently to fit preconceived ideas, the author takes on and explains and documents all Book of Mormon references to geology and meteorology. The authors approach is meticulous and scientific. This book is a landmark event in Book of Mormon studies and is a book that must be read by every serious student of the Book of Mormon. An analysis of the etymology of the unknown word "ziff" in the Book of Mormon and an analysis of the usage in a Mesoamerican context. 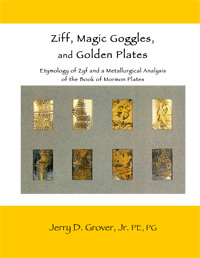 Also included is a metallurgical analysis of the Book of Mormon plates as to dimensions and alloy content. 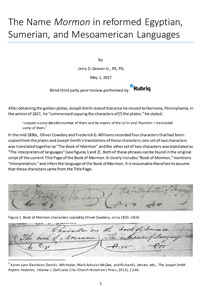 In the mid 1830s, Oliver Cowdery and Frederick G. Williams recorded four characters that had been copied from the plates and Joseph Smith's translations of those characters. Egyptian translations of these glyphs have been deciphered. One of these glyphs, the name Mormon in the reformed Egyptian, is found in hieratic Egyptian with meaning matching the Book of Mormon prophet Mormon. The glyph (Lazy-S) is found in the ancient Olmec and Maya cultures concurrent with Book of Mormon time frames. The meanings and depictions associated with the Mesoamerican Lazy-S glyph are consistent with the etymological meanings for the phonetic word Mormon found in Egyptian and Sumerian. Book of Mormon descriptions associated with the geographical locations identified as Mormon are consistent with the Mesoamerican meaning of the Lazy-S glyph. The Mesoamerican Mormon glyph may have originated in Sumerian proto-cuneiform. Published by Grover Publishing. This book is solid and full of technical details a trained linguist can really sink their teeth into. 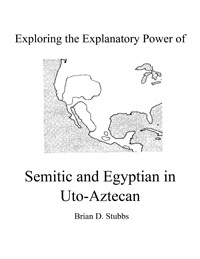 Brian Stubbs has toiled for decades as one of the foremost Uto-Aztecan linguists on the planet. Many thought his highly-acclaimed 2011 Uto-Aztecan: A Comparative Vocabulary would be his magnum opus. Turns out it was only Stubbs' warm-up act. All these years he has been patiently gathering massive data that shows profound Semitic and Egyptian influences in the language family spoken by Utes and Shoshoni on the north, Nahuatl on the south, and Hopi in between. This is a revolutionary, paradigm-changing book. This book is highly recommend this book for serious students of native American cultures.